In a small saucepan mix sugar and cornstarch together. Gradually stir in water. Cook over medium heat, stirring constantly, until mixture thickens and boils. Boil 1 minute. Remove from heat. Stir in remaining ingredients. The zest of the lemon is the yellow part of the rind, finely grated. You can make an orange sauce by simply replacing the lemon juice and zest with orange juice and orange zest. This velvety lemon concoction is actually a very versatile dessert sauce. It tastes wonderful drizzled over dessert recipes like cake, bread puddings, ginger bread and cheesecake. Personally, I love it so much, I don’t know if I care if I have anything to drizzle it over. My fingers, maybe? If you like this recipe, I’d love you to Pin it to Pinterest, Tweet about it, Like it on Facebook and leave your own tasty recipes below. 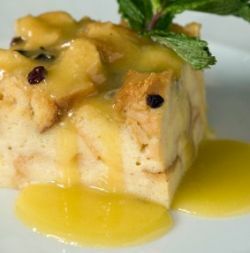 Our lemon sauce is perfect served over lemon cheesecake squares.